Pens win for their papas: Freshly-recalled Chris Conner scored two goals, Geno Malkin scored on the power play, and Marc-Andre Fleury stopped 28 of 30 shots in leading the Pens to a 4-2 win over the NY Rangers at Madison Square Garden. As a reward for his great game, Conner was sent down this morning. Once again in attendance were a number of the Pens' dads who were there celebrating the team's fourth annual "Dad's Trip", which I think is one of the coolest traditions going - although Ray Shero joked that if the Pens' record didn't improve during the Dad's trip games that he would change it to a "Mom's Trip" next season. Luckily, a 2-0 record this year should keep the fathers in business one more year. Sergei Gonchar, Kris Letang, and Sidney Crosby each had two assists for the Pens, and Pascal Dupuis added a victory cigar of an empty netter to officially suffocate the Rangers. 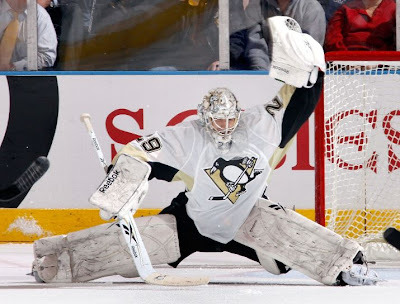 The Pens played without Alex Goligoski, Max Talbot, and Bill Guerin, who were all nursing injuries. In contrast to Sunday's game against the Flyers, this was a much cleaner contest, with the Penguins getting just two power play opportunities. The Pens' PK unit once again did a solid job, holding the Rangers scoreless on four PP attempts. Willie Parker moving on? That's certainly what it sounds like, especially if you read today's article from Gerry Dulac in the PG. New blog alert: Be sure to check out Beamer in Korea, written by former Pittsburgher James who, as the name implies, is now in Korea. Showing up at a free event to get autographs and paying your way into a stadium to watch them play are two entirely different things. When the Pirates are drawing big crowds on a regular basis without the aid of fireworks, skyblasts, bobbleheads, Donny Iris concerts (or whatever), pierogie races, etc. 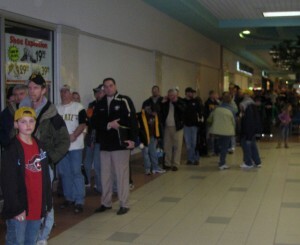 . . then I'll believe people are excited about the Pirates. Until then, I'm merely convinced Pittsburghers are excited about the "entertainment experience". I mean seriously man, do you go to games? We have some of the worst fans in the world attending those games. Half the people don't know the score, most of the other half uses the game itself like most of us use commercial breaks. But hey, they sure know all the words to the songs the band is singing that night. Can't tell me who's playing shortstop, but they can rattle off the names of the pierogies. For goodness sake, you should take a walk down federal street in the middle of the fourth inning on a skyblast night. The bars along there are full of people. Guess what. . . THOSE PEOPLE HAVE TICKETS TO THE GAME! They aren't there to see baseball, they're there to see Donny Iris (or whatever). I read Dejan's interview with Bob Nutting yesterday, what a joke. I don't even think there is anything more that I can say. They are never going to get better. They are hoping to get every single player on the roster to have a career year all at once, then sell 'em all off. I will take my chances playing the powerball on a bi-weekly basis because I have a better shot at winning that and then pelting Satan with a snowball than Nutting's formula for on-field success. And i dont want to hear: well, they're doing their job, making money on a business. I am tired of it. People still care about the Pirates?? Interesting... at any rate, please quit talking about them. Or you could just quit reading...that would work right? I'm not even going to respond to the ignorant comments on Nutting and the Pirates. Although I think Jmarinara makes a good point about Pirate crowds; they have to sell tickets somehow, and based on most Pittsburghers' opinions (not mine) people aren't going for the baseball. Just like with Pitt basketball in the mid to late 90s and Penguins hockey in the early 00s, once the Pirates begin competing (2011-2012), people will come, and more importantly, come for the baseball. On a separate note, Buccigross is actually not from Western PA, but Eastern OH (Steubenville to be exact). Although since S'ville is considered the "burb of the burgh", I guess it's okay for him to say he's from Pittsburgh. Other notable Stuebenvillers (is that right?) include Jimmy the Greek and Cincinatti QB Zach Collaros. Dennis Miller has used the word on National programs in the past. Maxwell: You're right, but the difference is the Pens and Pitt actually cared about winning, and they've done a great job at it. Nutting does not care about winning. He's a business man, nothing more. I've said it before and I'll say it again: One day, the Pirates will be a good baseball team, maybe even good enough to compete for the division. And that's when Nutting will have the chance to spend that extra dollar, to go after some free agents, to keep our own good players, to push the Pirates to the next level of contender, and he simply will not do it, cause he'll be happy with the stadium selling out to watch a 90 win baseball team. Maybe then the Koolaid will wear off, but probably not. Dean Martin is also from Steubenville.